Joseph Lincoln "Hisser" Canada Goose | Decoys Unlimited, Inc.
Classic carving of a hissing Canada goose by Joseph W. Lincoln (1859 -1938) of Accord Village, Hingham, MA. Serpentine neck terminates in an expertly crafted head. Superb, dry, original paint in impeccable condition with Lincoln’s best painted feather detail. Two stick holes in base for use as a stick up as part of the “beach team” at the gunning stand. Thin, typical check in the base as is so common with Lincoln geese. Small area of dry rot in base near one stick hole. Mounted on two wooden stakes in front of the Brayton shooting blind in Westport, MA. The other was once part of the Thomas Figge collection and is now in the prestigious “Tudor” Jones collection of American bird decoys along with the sleeping Lincoln goose from this rig. 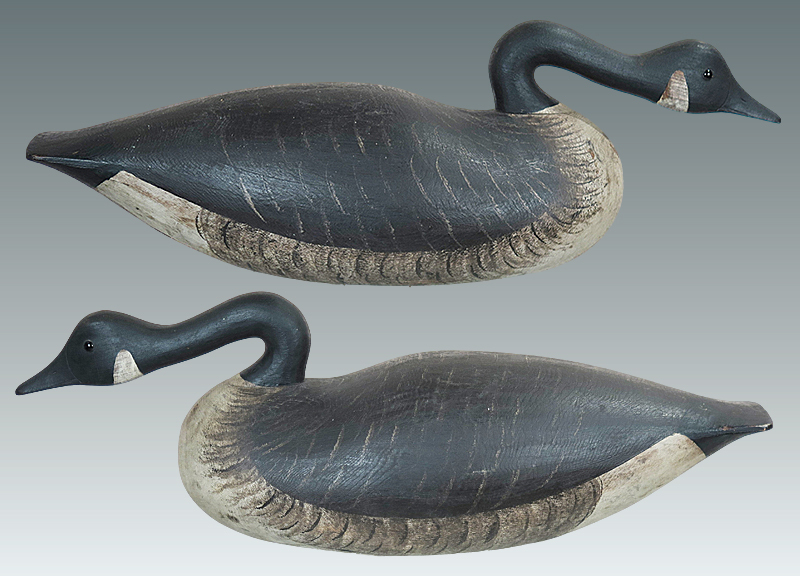 This carving has been featured in numerous shows including the Peabody Museum exhibit of classic Massachusetts decoys titled “Tollers and Tattlers: Massachusetts Waterfowl Decoys 1840-1940,” as well as in articles and books, not the least of which are inclusion on Page 39 (Exact bird) in “Joseph W. Lincoln” by Cap Vinal. This Lincoln hissing goose decoy is also pictured on page 35 of American Vernacular by Frank Maresca and Roger Ricco. The bird was purchased in 1937 after the ban on live decoys by the Brayton family of Westport, Massachusetts. A picture of the rig is on page 57 (see below) in the Vinal reference and this bird is in the back row on the left. It was used at the Brayton family stand on Hicks Cove in Westport as well as at their other stand at Westport Harbor. Conceivably this is the finest Lincoln goose known and has had only one owner since it was purchased directly from the Brayton family. The “beach birds” survived well as they were mounted in a poured cement area in front of the blind and were not exposed to saltwater.